Pinus taeda, commonly known as loblolly pine, is one of several pines native to the Southeastern United States, from central Texas east to Florida, and north to Delaware and southern New Jersey. The wood industry classifies the species as a southern yellow pine. U.S. Forest Service surveys found that loblolly pine is the second-most common species of tree in the United States, after red maple. For its timber, the pine species is regarded as the most commercially important tree in Southeastern US. The common name loblolly is given because the pine species is found mostly in lowlands and swampy areas. Loblolly pine is the first among over 100 species of Pinus to have its complete genome sequenced. As of March 2014, it was the organism having the largest sequenced genome size. Its genome, with 22 billion base pairs, is seven times larger than that of humans. As of 2018, assembly of the Axolotl genome (32Gb) displaced loblolly pine as the largest assembled genome. Loblolly pine can reach a height of 30–35 m (98–115 ft) with a diameter of 0.4–1.5 m (1.3–4.9 ft). Exceptional specimens may reach 50 m (160 ft) tall, the largest of the southern pines. Its needles are in bundles of three, sometimes twisted, and measure 12–22 cm (4 3⁄4–8 3⁄4 in) long, an intermediate length for southern pines, shorter than those of the longleaf pine or slash pine, but longer than those of the shortleaf pine and spruce pine. The needles usually last up to two years before they fall, which gives the species its evergreen character. Although some needles fall throughout the year due to severe weather, insect damage, and drought, most needles fall during the autumn and winter of their second year. The seed cones are green, ripening pale buff-brown, 7–13 cm (2 3⁄4–5 in) in length, 2–3 cm (3⁄4–1 1⁄4 in) broad when closed, opening to 4–6 cm (1 1⁄2–2 1⁄4 in) wide, each scale bearing a sharp spine 3 to 6 mm (0.12 to 0.24 in) long. The tallest loblolly pine currently known, which is 51.4 m (169 ft) tall, and the largest, which measures 42 m3 (1,500 cu ft) in volume, are in Congaree National Park. The word "loblolly" is a combination of "lob", referring to thick, heavy bubbling of cooking porridge, and "lolly", an old British dialect word for broth, soup, or any other food boiled in a pot. In the southern United States, the word is used to mean "a mudhole; a mire," a sense derived from an allusion to the consistency of porridge. Hence, the pine is named as it is generally found in lowlands and swampy areas. Loblolly pines grow well in acidic, clay soil, which is common throughout the South, thus are often found in large stands in rural places. Other old names, now rarely used, include oldfield pine, due to its status as an early colonizer of abandoned fields; bull pine, due to its size (several other yellow pines are also often so named, especially large isolated specimens); rosemary pine, due to loblolly's distinctive fragrance compared to the other southern pines; and North Carolina pine. For the scientific name, Pinus is the Latin name for the pines and taeda refers to the resinous wood. With the advent of wildfire suppression, loblolly pine has become prevalent in some parts of the Deep South that were once dominated by longleaf pine and, especially in northern Florida, slash pine. The rate of growth is rapid, even among the generally fast-growing southern pines. The yellowish, resinous wood is prized for lumber, but is also used for wood pulp. This tree is commercially grown in extensive plantations. Loblolly pine is the pine of the Lost Pines Forest around Bastrop, Texas, and in McKinney Roughs along the Texas Colorado River. These are isolated populations on areas of acidic sandy soil, surrounded by alkaline clays that are poor for pine growth. A study using loblolly pines showed that higher atmospheric carbon dioxide levels may help the trees to endure ice storms better. The famous "Eisenhower Tree" on the 17th hole of Augusta National Golf Club was a loblolly pine. U.S. President Dwight D. Eisenhower, an Augusta National member, hit the tree so many times that at a 1956 club meeting, he proposed that it be cut down. Not wanting to offend the President, the club's chairman, Clifford Roberts, immediately adjourned the meeting rather than reject the request outright. In February 2014, an ice storm severely damaged the Eisenhower Tree. The opinion of arborists was that the tree could not be saved and should be removed. The "Morris Pine" is located in southeastern Arkansas; it is over 300 years old with a diameter of 142 cm (56 in) and a height of 35.7 m (117 ft). Loblolly pine seeds were carried aboard the Apollo 14 flight. On its return, the seeds were planted in several locations in the US, including the grounds of the White House. As of 2016[update], a number of these moon trees remain alive. Pines are the most common conifers and the genus Pinus consists of more than 100 species. Sequencing of their genomes remained a huge challenge because of the high complexity and size. 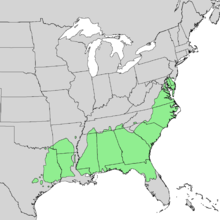 Loblolly pine became the first species with its complete genome sequenced. This was the largest genome assembled until 2018, when the Axolotl genome (32Gb) was assembled. The loblolly pine genome is made up of 22.18 billion base pairs, which is more than seven times that of humans. Conifer genomes are known to be full of repetitive DNA, which make up 82% of the genome in loblolly pine (compared to only 50% in humans). The number of genes is estimated at about 50,172, of which 15,653 are already confirmed. Most of the genes are duplicates. Some genes have the longest introns observed among 24 fully sequenced plant genomes. Gymnosperms are predominantly outcrossing, but lack genetic self-incompatibility. Loblolly pine, like most gymnosperms, exhibits high levels of inbreeding depression, especially in the embryonic stage. The loblolly pine harbors an average load of at least eight lethal equivalents. A lethal equivalent is the number of deleterious genes per haploid genome whose cumulative effect is the equivalent of one lethal gene. The presence of at least eight lethal equivalents implies substantial inbreeding depression upon self-fertilization. ^ Farjon, A. (2013). "Pinus taeda". The IUCN Red List of Threatened Species. IUCN. 2013: e.T42420A2978958. doi:10.2305/IUCN.UK.2013-1.RLTS.T42420A2978958.en. Retrieved 27 December 2017. ^ a b Kral, Robert (1993). "Pinus taeda". In Flora of North America Editorial Committee (ed.). Flora of North America North of Mexico (FNA). 2. New York and Oxford – via eFloras.org, Missouri Botanical Garden, St. Louis, MO & Harvard University Herbaria, Cambridge, MA. ^ a b Baker, James B.; Langdon, 0. Gordon (1990). "Pinus taeda". In Burns, Russell M.; Honkala, Barbara H. (eds.). Conifers. Silvics of North America. Washington, D.C.: United States Forest Service (USFS), United States Department of Agriculture (USDA). 1 – via Southern Research Station (www.srs.fs.fed.us). ^ Nix, Steve. "Ten Most Common Trees in the United States". About.com Forestry. Retrieved 11 January 2013. ^ "Loblolly Pine". Plant Information Center. Retrieved 27 March 2014. ^ "Loblolly pine". Virginia Tech Forestry Department. Retrieved 27 March 2014. ^ "Loblolly Pine". Tree Improvement Programme. Retrieved 27 March 2014. ^ a b The American Heritage® Dictionary of the English Language (4th ed.). Houghton Mifflin Company. 2000. ^ a b Zimin, A.; Stevens, K. A.; Crepeau, M. W.; Holtz-Morris, A.; Koriabine, M.; Marcais, G.; Puiu, D.; Roberts, M.; Wegrzyn, J. L.; de Jong, P. J.; Neale, D. B.; Salzberg, S. L.; Yorke, J. A.; Langley, C. H. (2014). "Sequencing and Assembly of the 22-Gb Loblolly Pine Genome". Genetics. 196 (3): 875–890. doi:10.1534/genetics.113.159715. PMC 3948813. PMID 24653210. ^ a b Main, Douglas (20 March 2014). "Scientists Sequence The Largest Genome To Date". Popular Science. A Bonnier Corporation Company. Retrieved 27 March 2014. ^ a b Eugene W. Myers, Sergej Nowoshilow (2018). "The axolotl genome and the evolution of key tissue formation regulators". doi:10.1038/nature25458. ^ Farjon, A. (2005). Pines. Drawings and descriptions of the genus Pinus, ed.2. Brill, Leiden ISBN 90-04-13916-8. ^ Earle, Christopher J., ed. (2018). "Pinus taeda". The Gymnosperm Database. ^ Moore, Gerry; Kershner, Bruce; Tufts, Craig; Mathews, Daniel; Nelson, Gil; Spellenberg, Richard; Thieret, John W.; Purinton, Terry; Block, Andrew (2008). National Wildlife Federation Field Guide to Trees of North America. New York: Sterling. p. 73. ISBN 1-4027-3875-7. ^ Oklahoma Biological Survey: Pinus taeda L.
^ Richardson, D. M., & Rundel, P. W. (1998). Ecology and biogeography of Pinus: an introduction. Pages 3–46 in Richardson, D. M., ed. Ecology and biogeography of Pinus. Cambridge University Press ISBN 0-521-55176-5. ^ "Masters landmark Ike's Tree suffers major damage, removed". The Augusta Chronicle. February 16, 2014. Retrieved February 17, 2014. ^ Bragg, Don C. "The Morris Pine" (PDF). Bulletin of the Eastern Native Tree Society. Volume 1 (Summer 2006): 20. Retrieved 2012-11-13. ^ Williams, David R. (28 July 2009). "The "Moon Trees"". Goddard Space Flight Center. NASA. Retrieved 8 March 2016. ^ Neves, Leandro G.; Davis, John M.; Barbazuk, William B.; Kirst, Matias (2013). "Whole-exome targeted sequencing of the uncharacterized pine genome". The Plant Journal. 75 (1): 146–156. doi:10.1111/tpj.12193. PMID 23551702. ^ Neale, David B; Wegrzyn, Jill L; Stevens, Kristian A; Zimin, Aleksey V; Puiu, Daniela; Crepeau, Marc W; Cardeno, Charis; Koriabine, Maxim; Holtz-Morris, Ann E; Liechty, John D; Martínez-García, Pedro J; Vasquez-Gross, Hans A; Lin, Brian Y; Zieve, Jacob J; Dougherty, William M; Fuentes-Soriano, Sara; Wu, Le-Shin; Gilbert, Don; Marçais, Guillaume; Roberts, Michael; Holt, Carson; Yandell, Mark; Davis, John M; Smith, Katherine E; Dean, Jeffrey FD; Lorenz, W Walter; Whetten, Ross W; Sederoff, Ronald; Wheeler, Nicholas; McGuire, Patrick E; Main, Doreen; Loopstra, Carol A; Mockaitis, Keithanne; deJong, Pieter J; Yorke, James A; Salzberg, Steven L; Langley, Charles H (2014). "Decoding the massive genome of loblolly pine using haploid DNA and novel assembly strategies". Genome Biology. 15 (3): R59. doi:10.1186/gb-2014-15-3-r59. PMC 4053751. PMID 24647006. ^ Wegrzyn, J. L.; Liechty, J. D.; Stevens, K. A.; Wu, L.-S.; Loopstra, C. A.; Vasquez-Gross, H. A.; Dougherty, W. M.; Lin, B. Y.; Zieve, J. J.; Martinez-Garcia, P. J.; Holt, C.; Yandell, M.; Zimin, A. V.; Yorke, J. A.; Crepeau, M. W.; Puiu, D.; Salzberg, S. L.; de Jong, P. J.; Mockaitis, K.; Main, D.; Langley, C. H.; Neale, D. B. (2014). "Unique Features of the Loblolly Pine (Pinus taeda L.) Megagenome Revealed Through Sequence Annotation". Genetics. 196 (3): 891–909. doi:10.1534/genetics.113.159996. PMC 3948814. PMID 24653211. ^ Remington DL, O'Malley DM (2000). "Whole-genome characterization of embryonic stage inbreeding depression in a selfed loblolly pine family". Genetics. 155 (1): 337–48. PMC 1461072. PMID 10790407. This page was last edited on 10 March 2019, at 20:28 (UTC).